The Skinny: Entertaining little movie from UFO that manages to take iffy subject matter and create a workable comedy. by Kozo: This Gen X comedy-drama is a reasonably solid effort from the people at UFO. The story involves three friends (Jordan Chan, Andy Hui, and Julien Cheung) who meet a loose girl named Angel at a bar, and how IT ALL GOES TO HELL afterwards. To wit: obviously distressed, she drinks and imbibes drugs, and then proceeds to do all three of the guys separately. Then, she takes a header off the balcony. When questioned in the hospital, she declares she was raped while the cops and her family watch on. Then, she tries to off herself and goes into a coma. Needless to say, this causes major waves all over the place, as the three friends try to maintain their innocence and their friendship. It looks bad though, so they start to fend for themselves by telling lies. What happens? They turn the whole trial into a major circus. 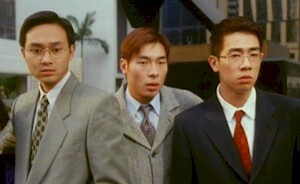 Helping matters is Lau Ching-Wan in the “star” role as their defense attorney, whose wacky antics either make or break the film - depends on your preference. image courtesy of Widesight Entertainment, Ltd.